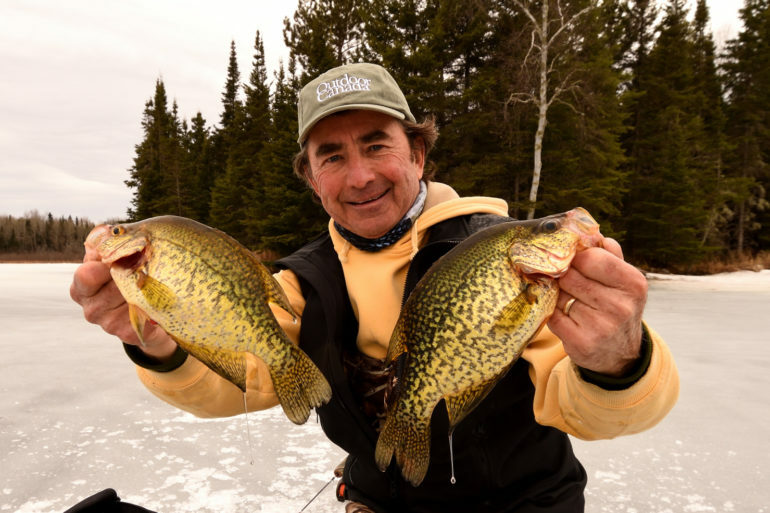 Every hardwater angler knows ice is never 100 per cent safe. There are just too many variables—from snow cover to temperature change to current—that can affect its strength. You can minimize the risk when walking or driving out onto the ice, however, by using common sense, watching the weather and keeping these safety tips in mind. There is safety in numbers, so whenever possible, go ice fishing with a buddy. And before you go, search online or contact local tackle shops or outfitters for ice reports. Also make sure someone at home knows where you’re going, and when you expect to return. The ice should be at least four inches thick before you head out on foot. Use an ice chisel, or spud bar, to test the ice about 15 metres from shore. If you can get down four inches without seeing water, you should be fine. To be certain, make a hole with your auger and measure the thickness of the ice. Also note the colour of the ice—dark blue or black best. Keep in mind that the ice is much thinner around river inlets and outlets, and that water farther from shore takes longer to freeze. To support an ATV or snowmobile, the ice needs to be at least five inches thick. For a car, it should be eight to 12 inches, and 12 to 15 inches for a mid-size truck. When driving from spot to spot, watch for pressure cracks and avoid areas with current or open water. Also steer clear of gaps between the shore and the ice. If you’re in a car or truck, roll down the window and remove your seatbelt so you can get out easier if your vehicle does happen to break through. Note that many insurance companies will void your policy once your vehicle travels onto ice. When on the ice, wear a PFD or flotation suit, and carry a pair of ice spikes. Also wear removable ice cleats or crampons to avoid slipping. If you do go through, it’s important to control your breathing—inhaling water while gasping from cold-water shock causes most drownings. Get horizontal as soon as possible, kick hard to propel forward and use the spikes to pull yourself out. 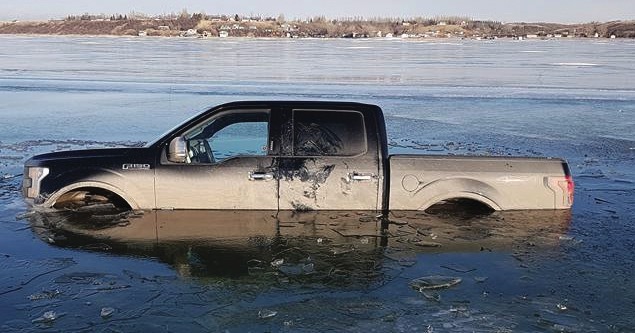 Once out, roll toward thicker ice and get warm as soon as possible to avoid hypothermia; always store a change of clothes in your ice-fishing shelter or vehicle. Whether travelling on foot or by vehicle, bring a safety kit that includes the following: flashlight or headlamp, compass and GPS unit, whistle, survival blanket, waterproof matches, candles, hand-warmer packs and a throw rope. Also consider getting a Nebulus Emergency Flotation Device, an inflatable raft than can support up to three adults and a submerged ATV or snowmobile (see www.nebulusflotation.com). For even more ice safety tips, go to www.outdoorcanada.ca/icesafety.